Acacia Solid Top Series – Solid Acacia top, Laminated Acacia back and sides, with a smooth satin finish. Features: wide comfortable Walnut fingerboard, Nubone XB® nut and saddle. Mahogany Series – Laminated top, back and sides, with a smooth satin finish. 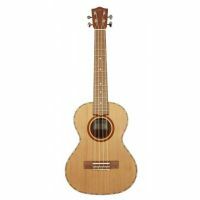 Features: wide comfortable, Walnut fingerboard, Nubone XB® nut and saddle. Quilted Maple Series – Laminated top, back and sides, with a glossy finish. Features: cutaway with Fishman® Kula pre-amp and tuner, Slotted Headstock, Nubone XB® nut and saddle, chrome strap buttons. Cedar Solid Top Series – Solid Cedar top, maple binding with wood purfling, laminated Mahogany back and sides, with a smooth satin finish. Flame Maple Series – Laminated top, back and sides, with a smooth satin finish with Bloodwood binding. Features: wide comfortable Walnut fingerboard, Nubone XB® nut and saddle, chrome open back tuners. Flame Maple Series – Laminated top, back and sides, with a smooth satin finish with Bloodwood binding. Features: wide comfortable Walnut fingerboard, Nubone XB® nut and saddle. 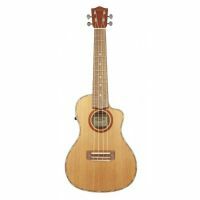 This Acacia Solid Top 5-string (high G and low G) cutaway electric tenor ukulele by Lanikai is equipped with many features such as a wide comfortable neck profile, satin-finished select figured woods and open back tuners.